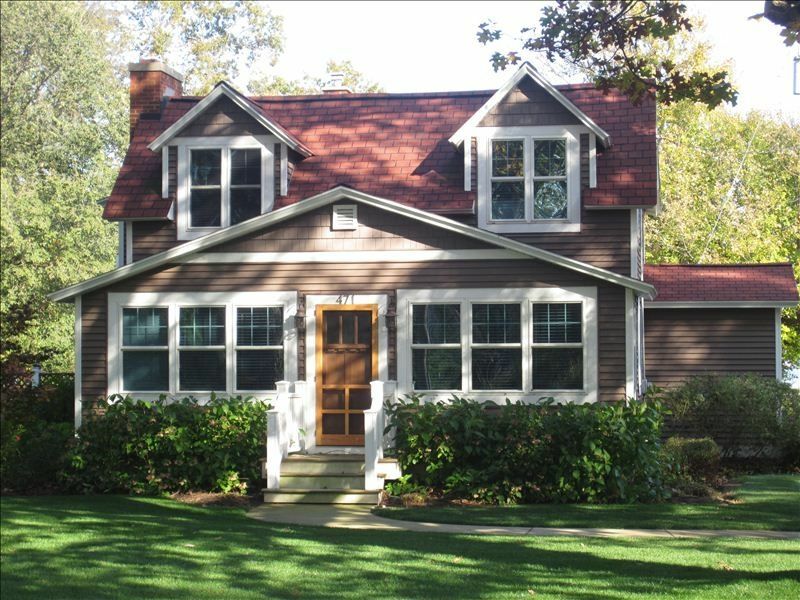 Newly remodeled Lake Street cottage available for a relaxing vacation in Holland, Michigan. The cottage is decorated with Pottery Barn style furnishings. Holland State Park is less than a mile from the cottage and Lake Macatawa is within walking distance. The vacation home has four bedrooms, two full bathrooms. All bedrooms are located on the second floor. Two bedrooms are furnished with queen beds and the two other bedrooms are furnished with twin beds. Large living room and sun room provide plenty of space for a comfortable vacation. The kitchen is fully equipped with beautiful Kraft maid cabinets and stainless steel appliances. This was just perfect for our needs, close to family and friends. This cozy home had everything we needed to enjoy our stay in Holland Michigan. I would give 5 stars to this property. We did enjoy the amenities and used grill and outside space almost every day. The beach was an easy walk for us and we did use the wagon and chairs to go to the beach. The cottage had an ample supply of cook wear and appliances to meet our cooking needs. We loved the front enclosed porch and found it the perfect place to have family play games and socialize during our stay. Many upgrade were evident throughout the cottage. We found a couple local restaurants that we frequented often and downtown Holland was only a few minutes away with many shops and restaurants. We would stay again if we go back to Michigan to visit family. Lovely home in the perfect location! Beautifully decorated and remodeled home. Fully stocked kitchen and all necessary supplies for a great day the the beach. We loved our stay! Location and house was perfect. Close to the beach and biking paths. House was very clean and plenty of room for our family to spread out. Just Perfect! This cottage is absolutely adorable. We loved the layout (perfect for our family of 4), the Pottery Barn style decor, the close proximity to the beach and of course the General Store for daily ice cream and/or doughnuts! (the bikes & scooters provided were an added bonus!) Everything was well stocked and in good condition. We also loved the large driveway and beautiful yard. We created many memories here and hope to return in the future. Great location, super cute home with lots of amenities! I'd definitely stay there again! Walking or riding distance to most activities. Clean, warm and well appointed home. Great for families! Very cute place with lots of extras for the kids. There were bikes, scooters, beach equipment, books (adult & kids), toys/trinkets for younger ones. Plenty of beds, but it would have been nice to have one bigger bed as I think they were full and then twins. But not a deal breaker. I liked there was one tv in one bedroom no more in the other bedrooms. (We monitor what our kids view and it is a hassle if there is a tv in every room!) Overall very quaint and well equipt! Enjoyed our stay.